Cambridge: Cambridge University Press, 2015. Hardback, pp. xii + 289. ISBN 9781107100862; 9781316181478 (e-book). Price approx. £65.00, €74.00, $103.00. Agonicity is one of the most enduring features of human collectivity, evidenced since the dawn of human history in all traces of the past, from fossilised material through the oldest historical records to the (alas) infinite wealth of data from modern and most recent history. ‘Agonicity’ is a very broad category, encompassing various social practices designed to show that some people are better than others – stronger, for example, or more beautiful, more wealthy, more capable or more accomplished in a range of skills. Initially, the sole field of that rivalry in the human world was fighting and physical violence. In the written records of the oldest historical cultures, we have not yet discovered any evidence of the existence of non-martial varieties of agon. The first act of symbolic rivalry comes from ancient Greece. During the nineteenth and twentieth centuries, many books were written about the exceptional character of Greek culture compared to other ancient cultures. It was rarely noted, however, that among the innovations and inventions, new ideas and concepts with which the Greeks enhanced human existence, one of the most important was (and still is) the ability to symbolise conflict, to transfer agonic behaviours from the realm of war, fighting and violence to the realm of contests, games and regular rivalry aimed at gaining a symbolic, not material, advantage. During the classical era (the fifth century bce), the symbolisation of fighting culminated in the form of the tragic and comic agon, the first known ‘artistic competitions’ in the strict sense, which – just like presentday competitions – were situated within complex social contexts not entirely comprehensible to us today. The European Middle Ages did not add a great deal to the model of agonicity developed by the Greeks. In the wake of the reconnaissance by Norbert Elias, we generally accept today that institutions of ‘high culture’ began to arise in those medieval societies which had attained sufficiently stable inner balance that the ruling classes were able and wished to invest in kinds of activity that brought neither military nor political benefit, but could help to increase prestige. Such was the sociogenesis of courtly culture, with its troubadour competitions, poetry contests and displays of musical prowess. The Renaissance would adopt and develop those institutions and provide them with extensive resources in the form of institutionalised patronage. This model of civilised (in the Eliasian sense) agonic behaviours within an institution of ‘high culture’ endured until the end of feudal Europe. This state of affairs changed abruptly with the demise of the feudal social order. After consolidating their dominance in the geopolitically most important countries of Europe, the townsfolk saw no need to demonstrate their privileged position with regard to their opponents in political, military and (a crucial novelty here) economic games through art, which, partly as a consequence of this, acquired a romantic autonomy. Yet the agonic element retained its presence in artistic practices. Moreover, since those practices became dependent during the nineteenth century on the patronage of political power, the desire to test oneself in purely artistic rivalry began to emerge. That desire was fulfilled particularly distinctly in the institution that is the classical music performance competition. Here, the conditions for designing an agon were especially favourable, since the competitors have the same kind of instrument at their disposal and a pool of performance material that is relatively uniform with regard to the principles behind its construction, which at the same time (in the form of a canon of works composed ‘from Bach to Bartók’, constituting the repertoire of the overwhelming majority of music competitions) belongs to the cultural capital of the social groups that make up the audience of those competitions. 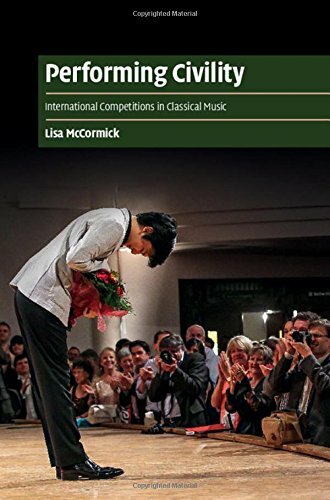 The details of this arrangement between the three groups involved – competitors, jurors and audience – are examined by Lisa McCormick in her book Performing Civility: International Competitions in Classical Music, a valuable contribution to sociologically and anthropologically orientated studies on music understood not only and not primarily as artistic work contained within the text of a score, but also as a social and cultural practice rooted and cultivated in numerous contexts not strictly related to sound. In her clear and detailed analyses, McCormick begins by establishing the theoretical framework for her study; particularly apt here is the six-part model for the analysis of ‘social performance’. The following chapters outline the origins of the musical competition as an institution (highlighting the contrast between the democratisation of the social institutions of the bourgeois world and the hierarchisation of artistic achievements that inevitably ensues from the agonicity of competitions) and present detailed considerations of both the mechanisms behind the organising of competitions and their social roles (constructed within the public discourse). The author, who does not hesitate to embellish her theoretical arguments with anecdotes from the history of famous competitions, then gives an account of the discursive construction of the roles of performer, juror and receiver (listenercum-viewer). Her proposed typologies of these three roles represent valuable points of reference both for further theoretical analysis and for case studies. Particularly noteworthy is the transformation of Adorno’s typology of the listener from more than sixty years ago. of the aesthetic and social principles that hold sway in Western culture, and its presence is probably one of the more crucial factors determining social interest in competitions. After all, what would be exciting about events in which the standard of the competitors was measured by a calliper or a metronome? The same holds true for other great rivalries. People watch the Olympic Games, the World Cup in football or world championships in any sport to experience the emotions resulting from the ambiguities, not the rigours, of the unfolding scenarios. No one would pay any attention to contests entirely devoid of the element of uncertainty. In the case of music competitions, the only certainty is that slips will be made by the performers. Everything on a higher level than the performers’ technical proficiency invites fascination. In our world, where we have already wearied of so many innovations, sensations, scandals and transgressions, Goethe’s maxim ‘In der Beschränkung zeigt sich erst der Meister’ remains current.